Dental implants are made of Titanium or Zirconia which is a ceramic material. However, due to their proven durability and restorative possibilities the titanium implants are the most reliable and common type of implants used in dentistry. Success rates of dental implants vary, depending on the quantity and quality of the supporting bone. However, dental implants have presented a high success rate of up to 97% in different literatures. With proper care, implants can last a lifetime. Heavy smokers, people suffering from uncontrolled chronic disorders such as diabetes, heart diseases, patients using medication for Osteoporosis or patients who have had radiation therapy to the head/neck area need to be evaluated on an individual basis. If you are considering implants, talk to your dentist to see if they are right for you. In general, dental implants are considered as a major dental treatment and the rebate for them is capped to different limits by different insurance providers. Detailed questions about your individual needs and how they relate to insurance should be discussed with your dentist and insurance provider. The first step in the dental implant process is the development of an individualized treatment plan. The plan addresses your specific needs and is prepared by a Dr Allan or Dr Chhoker who are specially trained and experienced in oral surgery and restorative dentistry. 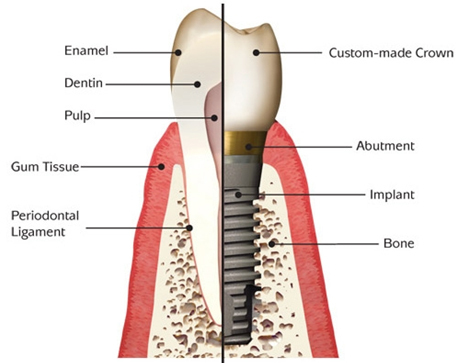 Once the implant has bonded to the jawbone, a small connector post, called an abutment is attached to the post to securely hold the new tooth. To make the new tooth or teeth, your dentist makes impressions of your teeth, and creates a model of your bite (which captures all of your teeth, their type, and arrangement). The new tooth or teeth is based on this model. A replacement tooth, called a crown, is then attached to the abutment. Your dentist also will match the colour of the new teeth to your natural teeth. Because the implant is secured within the jawbone, the replacement teeth look, feel, and function just like your own natural teeth. After the dental implant, mild soreness can be treated with over-the-counter pain medications, such as Nurofen or Panadol.